Nicole Korfanta directs the University of Wyoming Ruckelshaus Institute of Environment and Natural Resources, which supports informed and inclusive natural resource decision making. Previously she directed the Haub School’s academic programs. 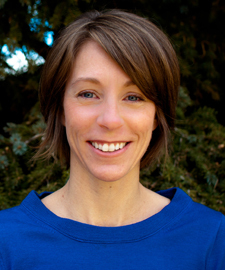 Nicole holds a PhD in Zoology and Physiology from the University of Wyoming and focuses on wildlife research that matters to management and policy questions in the West. Nicole is an Associate Editor and writer for Western Confluence magazine, which tells stories about the science and management of western natural resources. She also co-teaches the Haub School’s graduate capstone course on Environmental Assessment Practice, using an interdisciplinary case study approach to understand the most interesting natural resource challenges of our day. Korfanta, N. M. and V. H. Zero. In review. "Emerging issues in wind-wildlife impacts and mitigation—Ungulates, prairie grouse, and insects." In C. Moorman, S. Grodsky, and S. Rupp, editors. Renewable Energy and Wildlife Conservation. Johns Hopkins University Press, Baltimore, Maryland. Sawyer, H., N. M. Korfanta, R. M. Nielson, K. L. Monteith, D. Strickland. 2017. Mule deer and energy development—long-term trends of habituation and abundance. Global Change Biology, early web release. Korfanta, N. M. “Turbines on the horizon—How the western grid could unleash Wyoming wind energy, for better or worse” Western Confluence. Jan. 2017: 15-20. Korfanta, N. M. “Realtor conservationists—Anticipating residential development to protect habitat.” Western Confluence. Aug. 2016: 34-36. Korfanta, N. M. “The bone people—The booming business of antler hunting on public lands.” Western Confluence. Jan. 2016: 18-20. Freedman, K.S. and N.M. Korfanta. 2014. Public Opinion on Natural Resource Conservation in Wyoming. Wyoming Open Spaces Initiative. Laramie, Wyoming: Ruckelshaus Institute of Environment and Natural Resources. Korfanta, N. M., W. D. Newmark, M. J. Kauffman. 2012. Long-term demographic consequences of habitat fragmentation to a tropical understory bird community. Ecology 93: 2548-2559. Barclay, J. H., N. M. Korfanta, M. J. Kauffman. 2011. Long-term dynamics of a managed burrowing owl colony. Journal of Wildlife Management 75: 1295-1306.